Hp 642A (Cb401a) Cyan Original Laserjet Toner Cartridge "Product Category: Imaging Supplies And Accessories/Copier Fax & Laser Printer Supplies"
Product prices and availability are accurate as of 2019-04-08 15:11:30 EDT and are subject to change. Any price and availability information displayed on http://www.amazon.com/ at the time of purchase will apply to the purchase of this product. 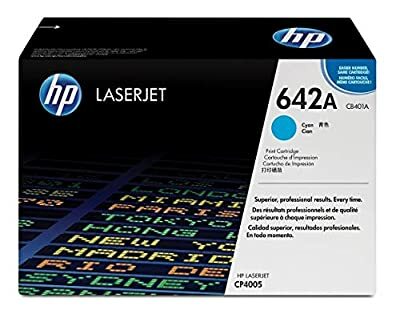 HP 642A (CB401A) Cyan Original LaserJet Toner Cartridge - HP toners give you bold graphics and realistic images that enable photo-quality business printing. - Every cartridge lets you enjoy fast print speeds without sacrificing print quality. - Reliable consistent results save you time and provide real value. - Device Types: Laser Printer Color(s): Cyan Page-Yield: 7500 Supply Type: Toner.